Anyways - like I said, last week was a busy one. All three kids started back to school...yes, all three. Bree went to school, PreK, for the first time. She also turned five last week. So...yeah...you guessed it, I got the full the worth of my overpriced waterproof mascara. It's no surprise, with my love for clothes and fashion, that I use clothing as a distraction. I am not kidding when I say that I save and plan fun outfits for days that I know I am going to need them. A great outfit can make my day so much better and kind of distract me from "stuff". I try to plan my outfits for the week on Sundays. I don't always stick to my plans (because I am moody :) ), but the important days I always plan. I KNEW that I needed a fun outfit for when the kids go back to school (because per the usual and the last few years, I would be a hot mess! ), so I put this one together. I didn't want my own personal issues to get in the way of such a big day for my kiddos. Not worth it! Worrying so much about your outfit can seem silly - but if it makes your day better which in turn makes your family's day better...starts sounding not so silly, right?! 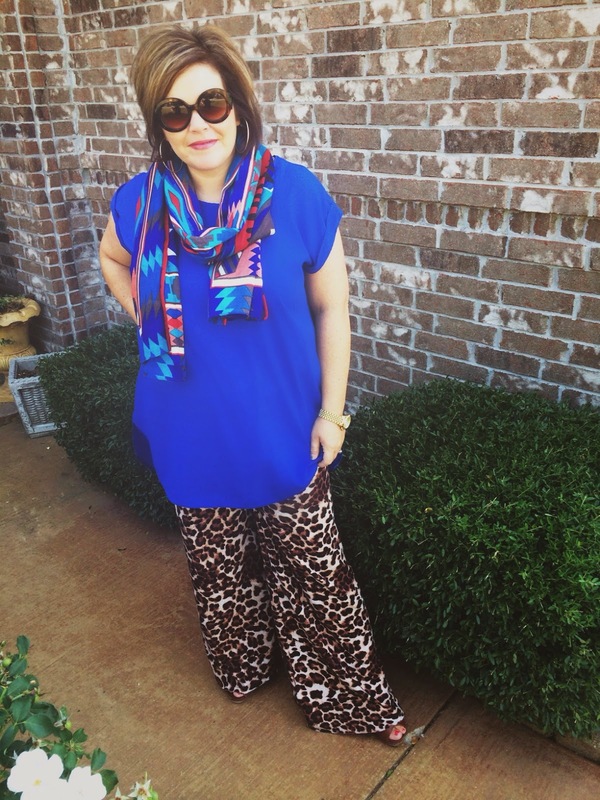 These leopard pants are some of my all time faves. I have managed to wear them for three seasons since I bought them last winter. They are super soft and COMFY, and not plus size, just large. I bought them from a friend and boutique owner and she does not have them in stock right now, but I linked some similar ones. 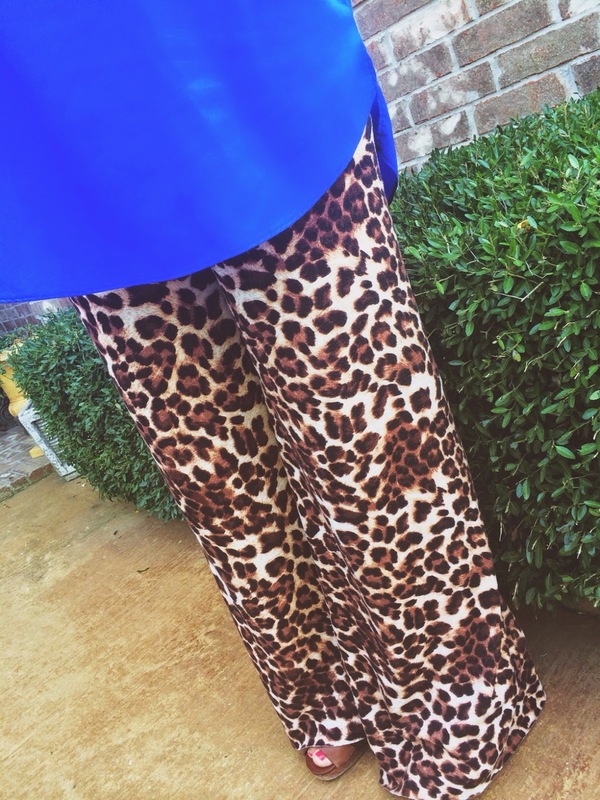 Don't be afraid of the palazzo pants trend. I was at first and there are times when I am not feeling them, but every time I wear them, I feel great and get tons of compliments. Most of them are a loud print so you can tone it down with a solid or "quieter" shirt. Since they are so "big" try not to wear a blousy shirt. We are supposed to wear them with a slimmer silhouette. I am not a fan of the slimmer silhouette most of the time because mama does not have the tummy for a slimmer silhouette, so I try to wear a tunic that is not as wide. If you get a piko that fits you right (we are going to talk Pikos later, promise! ), they look great too. If you are slimmer or are comfortable with your stomach, you should totally rock a fitted shirt. You will be amazed at how slimming this outfit will look then! I also mixed some major patterns here. If you are wanting to try that look - my best advice? Mix with leopard! 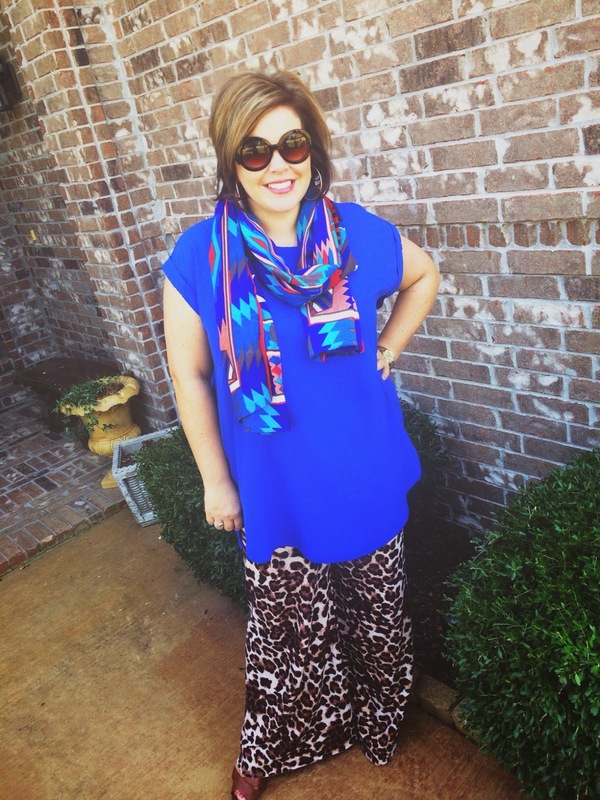 Leopard is a neutral and goes with almost everything. 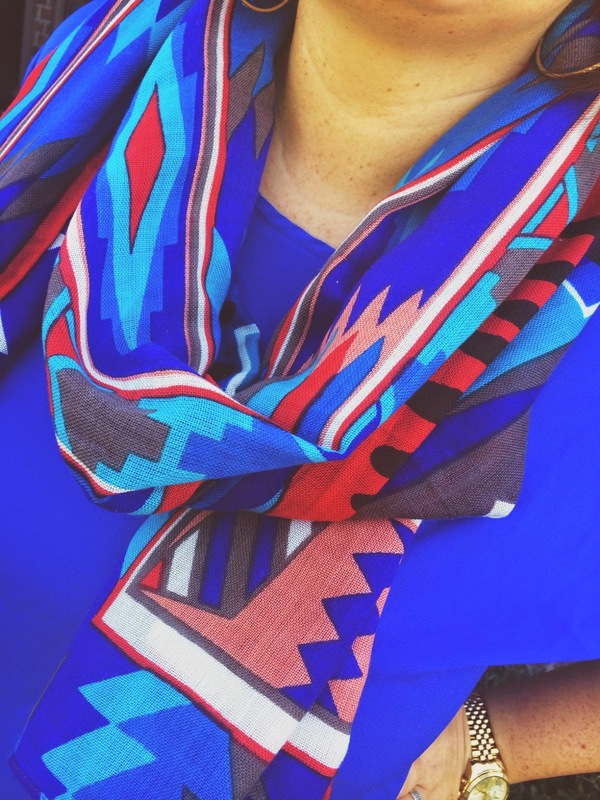 Try mixing it with an aztec print like this or plaid - both super easy and super chic! And I know y'all are looking for good jeans...look at all the options they have!!! Happy Tuesday friends!! Tell someone they are beautiful today...even if it is yourself :)! I always keep a good outfit on hold for a stressful day. if I know I am comfortable and confident in what I have on it is one less thing to stress about. glad to know I am not alone! Thank you!